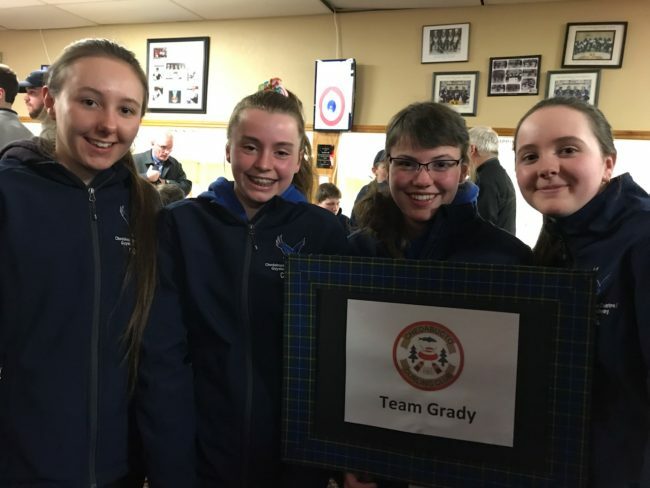 Team Grady from Guysborough Academy ( and Juniors at the Chedabucto CC) captured bronze in a tie-breaker team draw against Cobequid Education Centre. Congrats to the girls and their coach Alicia Mills. Pictured below is, from left to right, Skip Victoria Grady, Coach Alicia Mills, Second Hanna Manthorne, Mate Vanessa Dort and Lead Jenna Dort. 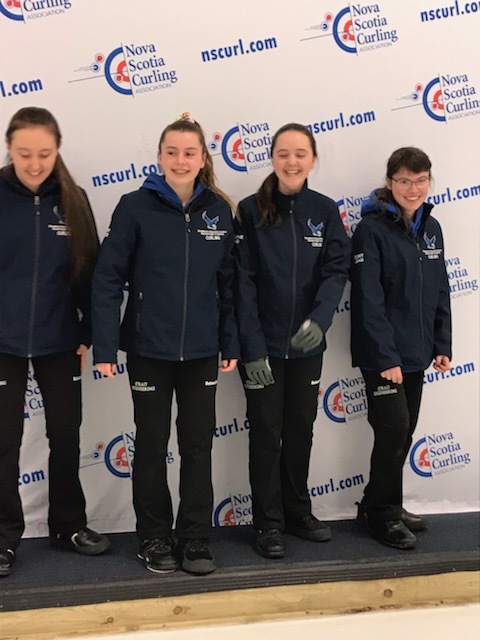 The Chedabucto Curling Club Jr Girls participated in the Under 18 Nova Scotia Curling Associations Provincials tournament March 8&9 . In a double knock out format the girls played against teams who have been competing at a provincial level for many years . These teams were seeded 3rd & 8th provincially . Although they were not successful in winning, they held their own in a 5-7 ( Team Nodding) and a 6-7 loss (Team Fitzgerald ) . Team members , Victoria Grady (Skip) , Vanessa Dort ( Mate) , Hanna Manthorne ( Second) and Jenna Dort ( Lead) are to be commended on a very well played tourny . Curling on ice that was new ( and much faster) than what they are used to and curling in front of a very large crowd and officials can be overwhelming , but this team made it look easy . Congratulations Team Grady ! WOW — The last-Thursday registration for the Chedabucto Curling Club Junior Curling Program was better than we had anticipated. We were a tad later in this season than we preferred to have had our Junior Curling Program registration but it was worth it. For the first time EVER at the CCC, there is now a Little Rockers (ages 6 – 9 years) branch of the Juniors Program with a registered enrollment of 16 youngsters. Charla Cosgrove is the Little Rockers head coach with assistance from Gary Neufeld for the Mondays, 3:30 PM – 4:30 PM, sessions. The registration in the regular Juniors (ages 10 years and older) was 10 youngsters with several more still out there as possible Junior members. Paul Long is the Juniors Head Coach, with assistance to both levels from Chedabucto CC members. The Juniors will have their coaching sessions on Wednesdays, 3:00 PM – 4:30 PM. 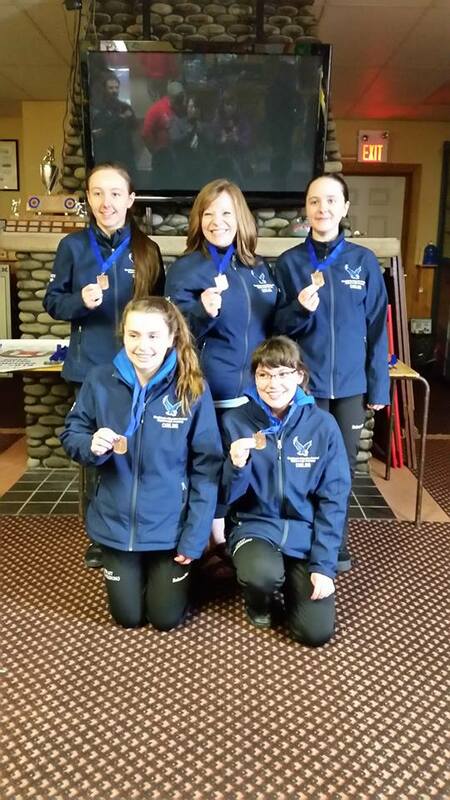 There is also our Junior Girls Team with coach Alicia Mills; a group of curlers for whom we are very proud. They will be training on Tuesdays, after school. All together we have — thus far — 26 members in the Junior Curling Program plus the competitive girls team; a very impressive reality for our rural Nova Scotia curling club. My sincere thanks to ALL for enabling the Chedabucto Curling Club Junior Curling Program to reach such success. Best wishes and Good Curling. 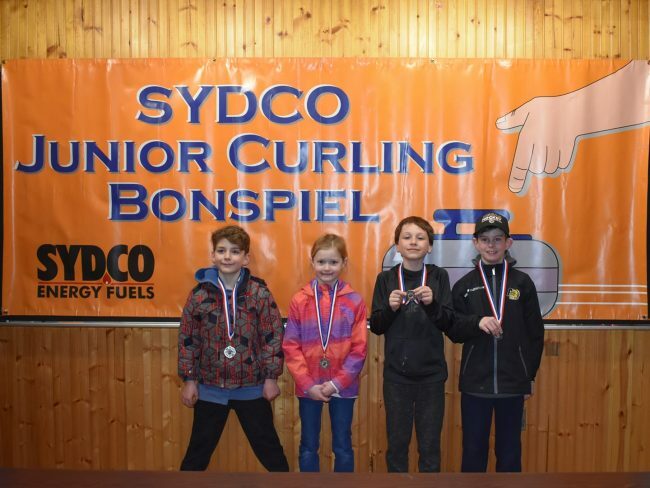 For a total of only $55.00 for this curling season, youngsters aged 6 years to 19 years can receive curling instructions at the Chedabucto Curling Club (CCC). I am extremely pleased to announce that the junior curling program at Boylston’s CCC has expanded to now include children ages 6 – 9 years, referred to as “Little Rockers”. The regular junior program receives youngsters 10 – 19 years and is referred to as “Juniors”. Curling experience is not a necessity. The CCC will provide experienced coaches. Mandatory head protectors (hockey or skating helmets) are a MUST for the Little Rockers. All other curling equipment is provided by the CCC. All curlers will need warm loose-fitting clothing, a warm jacket, clean in-door sneakers or curling shoes, and mitts or gloves. Registration date & time: (Bring child’s health card number) January 3rd from 6:00 PM – 8:00 PM. Where: Chedabucto Curling Club, 6 Reddys Hill, Boylston. See the attached for complete registration details plus Emergency Response Information / Registration 2018 – 2019 Little Rocker’s / Junior’s. With much gratitude to Charla, Gary and Paul, I am extremely pleased to announce that BOTH leagues of junior curlers will commence in January. Charla Cosgrove and Gary Neufeld were at a coaching session in Baddeck last Saturday and will be overseeing the Little Rockers (ages 6 – 9 years) on Mondays after school. The Little Rockers are new to the Chedabucto CC and we are very excited about the establishment of this curling program — Spread the news. Paul Long has agreed to be the head coach for the juniors program aged 10 years plus which will happen on Wednesdays after school. At the October Semi-AGM the dues for Juniors were set at $55.00 (HST inclusive). 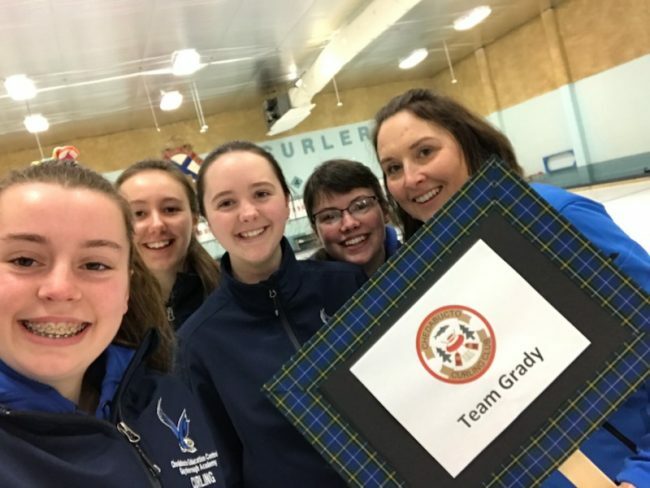 We look forward to last year’s youngsters returning and also welcome others to join, regardless if they are new to the sport or former junior curlers. More information about both programs will be forthcoming after we have had the opportunities to fine tune the programs so all will be pleased with what is being offered.